Howard Shultz vowed to hire 10,000 refugees around the world, and Mark Parker affirmed his company's commitment to Somali brand ambassador Mo Farrah. Two of America's most prominent brands have joined the protest against President Donald J. Trump's executive order banning immigration from seven Muslim-majority countries. On Sunday, Starbucks CEO Howard Shultz issued a letter vowing to hire 10,000 refugees over the next five years. The effort will begin in the US with an emphasis on hiring refugees who have served as interpreters or support personell for the American armed forces. "We have a long history of hiring young people looking for opportunities and a pathway to a new life around the world," Shultz wrote. "This is why we are doubling down on this commitment by working with our equity market employees as well as joint venture and licensed market partners in a concerted effort to welcome and seek opportunities for those fleeing war violence, persecution and discrimination." Shultz also vowed to communicate more often, and more quickly, with Starbucks staff during this "unprecedented time," using unspecified "new technology platforms." "These uncertain times call for different measures and communication tools than we have used in the past," he wrote. Nike CEO Mark Parker also raised his voice on Sunday, saying in a letter to employees that the company's values were being "threatened," and that the company did not support the President's ban. "Nike believes in a world where everyone celebrates the power of diversity," Parker wrote in a rare Sunday afternoon memo to employees. "Regardless of whether or how you worship, where you come from or who you love, everyone's individual experience is what makes us stronger as a whole." The ban took an immediate toll on Nike by threatning the legal status of Mo Farrah, a four-time gold-medal winning long-distance runner for Great Britain who was born in Somalia, one of the seven banned nations. Farrah, who is currently training in Ethiopia, wrote a forceful Facebook post over the weekend saying "Her Majesty The Queen made me a Knight of the Realm" last year, but "on 27th January, President Donald Trump seems to have made me an alien." Farrah, one of Nike's brand ambassadors, fears that he will be unable to re-enter the US. Parker said in his letter that the company would stand by him and the other foreign-born partners. "What Mo will always have—what the entire Nike family can always count on—is the support of this company," wrote Parker. "We will do everything in our power to ensure the safety of every member of our family: our colleagues, our athletes and their loved ones." The two CEOs joined a growing chorus of chief executives over the weekend, led by Silicon Valley bosses, condemning the executive order. Many cited their own dependence on foreign-born workers and the value their company places on religious tolerance. 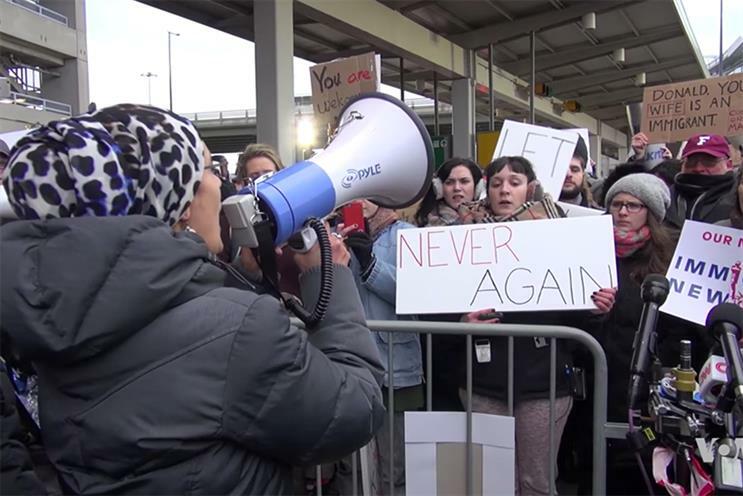 On Saturday, protests began forming at airports around the country, and that evening a federal judge responded to an ACLU lawsuit by placing a stay on the order that prevented the government from deporting some travelers. "Nike stands together against bigotry and any form of discrimination," Parker wrote. "We learned that on the field of play, where fairness and mutual respect are the rule, not the exception. Now more than ever, let's stand up for our values and remain open and inclusive as a brand and a company. We are at our best when we recognize the value of our diverse community." Who's behind those bizarre Nike spoof ads? Surprise: It's Nike.